I was delighted to win a tuition scholarship to attend this year’s Force11 Scholarly Communications Summer School in San Diego, California. The demanding pace of our work in the Library’s Research Services division means it’s tricky to take time out to consider our work in broader contexts. I was therefore grateful for the opportunity to spend a whole week debating pressing issues and potential innovations in the scholarly ecosystem with researchers, fellow librarians and thought leaders, especially in such a beautiful location with the chance of a trip to the beach! I loved hearing from Daniel O’Donnell and Maryann Martone on the concept of the Scholarly Commons, developed from considering what our system of scholarship would look like if we started it from scratch nowadays, with access to the internet and public funding. The Commons is ‘an extension of the Open Science concept,’ a ‘conceptual space or spaces onto which we can map principles, best practices, service and standards that govern the production and dissemination of scholarly and research works so that they are maximally useful to all who need or want them.’ Its underlying principles are still being developed, and we were encouraged to contribute our suggestions. We considered how implementation of the Commons principles could disrupt the scholarly ecosystem, with my group envisioning a dynamic system of research communication centred on the connections between research objects, allowing continuous, versioned peer review rather than final, formal publication. Our instructors likened this approach to Cameron Neylon’s aggregation model of scholarly communication. Cochrane’s John Hilton led an engaging class where we problematized the practise of peer review and appraised alternative methods of quality control for research. I was astonished to learn that peer review didn’t become standard practice until around the 1970s – did you know Crick & Watson’s ground breaking paper on the structure of DNA was never peer reviewed?! It was fascinating to consider how peer review occurs in many varied forms in addition to the formal, pre-journal-acceptance stage, though it’s often not recognised as such when it happens less formally, e.g. after conference presentations, on social media, and as comments on pre-print servers. I enjoyed exploring alternative approaches to peer review, such as F1000’s post-publication peer review platform (adopted by funders The Wellcome Trust and the Bill & Melinda Gates Foundation); RIO’s multi-phase peer review model; PubPeer; the Pinterest-like overlay journal tool Peeriodicals; and Elsevier’s awkwardly named Volunpeers. A key objective for me over the coming months, aligned with the Library’s plans to extend our open research support offer, is to increase my knowledge of the use of pre-prints in research today, including via pre-print repositories. This provocative class unapologetically generated more questions than answers. We’re increasingly comfortable thinking about Digital Humanities, but what about Open or Public Humanities? Can we have a Humanities which is Open or Public without being Digital? Can the Humanities be Public without being Open? (I think not). What do we even mean when we talk about the Humanities? Faced with instructor Samantha Wallace’s challenging question, ‘Can the University be removed from the Humanities?’, I was forced to confront my proprietorial stance, realising for the first time my assumption that expression or culture only become ‘the Humanities’ when the academy gets involved. I also recognised unpleasantly cynical and paternalistic notes to my thinking about Public Humanities, with assumptions about outreach work or community engagement as impact-demonstrating add-ons to research projects. I was grateful for UCSD Library’s Erin Glass’ insight that it’s unhelpful to refer blandly to ‘the public’ – this is an anonymous signifier for what are in reality distinct, identifiable communities with whom we in academic institutions should seek to build real relationships. Despite the often abstract discussion, I left this class with a practical takeaway. Prompted by Sidonie Smith’s comment on platforms and tools that ‘Just trying to stay abreast of what’s out there becomes a dizzying affair,’ I want to explore the Library’s role in supporting Humanist researchers interested in working more publicly and openly, perhaps through developing expertise with relevant platforms, tools and methods and sharing this with Humanities researchers through personal consultation. I’ll also be considering the class reflections of Micah Vandergrift, one of our instructors, for further thinking and ideas. Aside from deepening my understand of scholarly communication, especially problematic aspects of the traditional research publishing ecosystem and emerging challenges to these, the most valuable aspect of the Summer School was the opportunity to meet colleagues from around the world. Delegates represented six continents (no applicants from Antarctica sadly! ), and it was amazing to share experiences of managing Open Access funds with a librarian from Canada; discuss our Library’s DMP service with a research student from Chile; hear the plans of one of the first Scholarly Communication librarians to be appointed in Nigeria; and consider new theories of research collaboration developed by sociologists from Russia. Everyone I spoke to was passionate about open scholarship, generous with their insights and unafraid to challenge assumptions with nuanced arguments. The people – instructors, delegates and organisers – made FSCI a stimulating and inspiring event, and I left California with a refreshed sense of purpose and creativity which I hope to channel into enhancing our scholarly communication support at Manchester. The beginning of April marked the end of the fourth year of RCUK’s Open Access (OA) policy. We submitted our finance and compliance report in May and have made our 2016-17 APC data available via the University’s institutional repository, Pure. 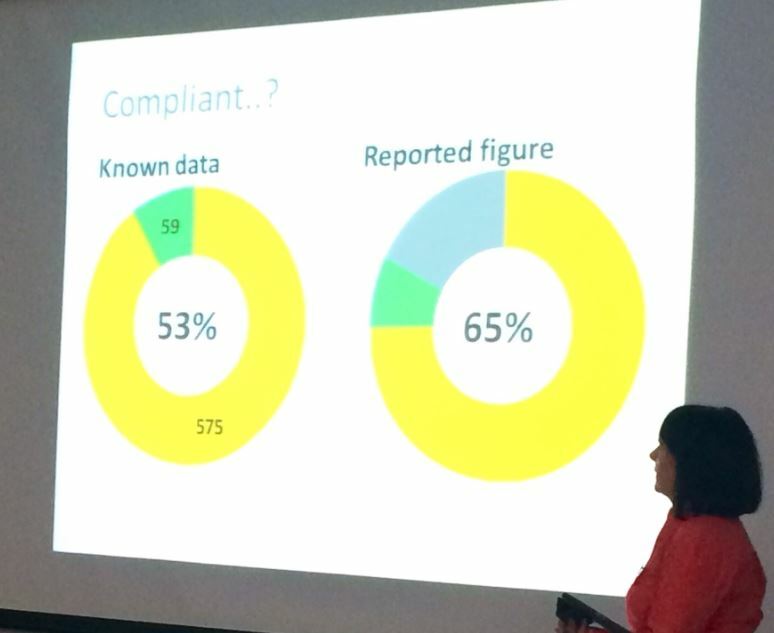 We have estimated 75% compliance for 2016-17 (54% Gold OA and 21% Green OA). This is a significant increase in Green OA. In part this is due to the launch of HEFCE’s OA policy but it is also a consequence of the constraints of the block grant, ie, we have been unable to meet demand for Gold OA during the reporting period. Despite the increase in Green OA, expenditure on Gold OA has not decreased. This is partly due to publishers that do not provide a compliant Green OA option but increased APC unit level costs are also a factor. We have reported an 18% increase in the average APC cost in 2016/17 (£1869) against the 2015/16 average (£1578). To some extent this increase can be accounted for by foreign exchange rate differences. Although we operate a ‘first come, first served’ model for allocating the block grant, it was necessary to impose restrictions for 3 months of this period. We limited expenditure to Pure Gold OA journals, non-OA publication fees and hybrid journals that do not provide a compliant Green OA option. The level of Gold OA achieved has only been possible due to continued investment from the University (£0.2m) and credits/discounts received from publishers relating to subscription packages and offsetting deals (£0.1m). 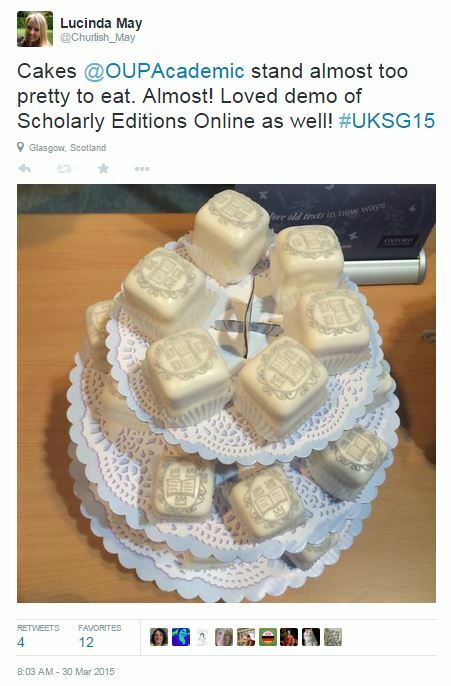 We arranged Gold OA with 60 different publishers. Of these, we managed offsetting schemes and memberships with 11 and arranged Gold OA for only one paper with 20. We continued to assess publisher deals to obtain best value from the block grant but are committed to engaging only with publishers that offer a reasonable discount and overall fair OA offer. As in previous years, most APCs were paid to Elsevier (139), almost double the number paid to the next publisher, Wiley (75). As in previous years, our highest cost APC (£4679) was paid to Elsevier. The lowest cost APC (£196) was paid to the Electrochemical Society. We reported expenditure of £72,297 on ‘other costs’. This amount includes colour and page charges as well as publication fees associated with Green OA papers. Despite reminders to authors that papers must be published as CC-BY, 8 papers were published under non-compliant licences and we were unable to identify licences for a further 16 papers. We contact publishers to correct licences when we are aware of a non-compliant licence. 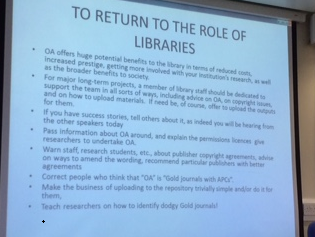 We continued to see engagement with Gold OA from Humanities researchers who produce outputs other than journal articles. We have supported Gold OA for one monograph and one book chapter during the reporting period, at a cost of £11,340 from the block grant. A further monograph has been paid for from an institutional OA fund. Despite a concerted effort on our part we continued to see inconsistency in the inclusion of grant acknowledgements on papers. We act in good faith when approving payment from the block grant but believe a joined up approach from RCUK, institutions and publishers is needed to ensure all researchers are aware and fulfil this requirement consistently. Predatory publishers: who CAN you trust? Some of the work we do extends beyond Manchester and is about sharing our experience. We are currently lead institution on opeNWorks, a Jisc-funded Pathfinder project which aims to share best practice with colleagues from the North West region who have limited experience of providing OA support for researchers and to develop a community of good OA practice. The purpose of the community is to ensure that trusted advice and resources are easily accessible to institutions that are unable to fund a full-time OA support post. If the resources and systems we have created are seen as examples of good practice then we’d like them to be representative of our views on OA and it is clear our views are not aligned with Beall’s. On the basis of what we’ve read – the Berger and Cirasella article recently posted on the LSE Impact Blog provides a good overview and entry points – and what Beall seems to have said in his recent presentation at the US STM conference, here are a few points on which we differ. Let’s start simply. There is a cost to publishing scholarly works. We know this and we’ve had frank conversations with publishing colleagues on this issue. In the subscription model authors (who may also be editors) tend to be unaware of the costs, and librarians are aware only of the costs to their own institutions. What’s ethical about this lack of transparency? It’s practically the OED definition of predatory (“unfairly competitive or exploitative”). 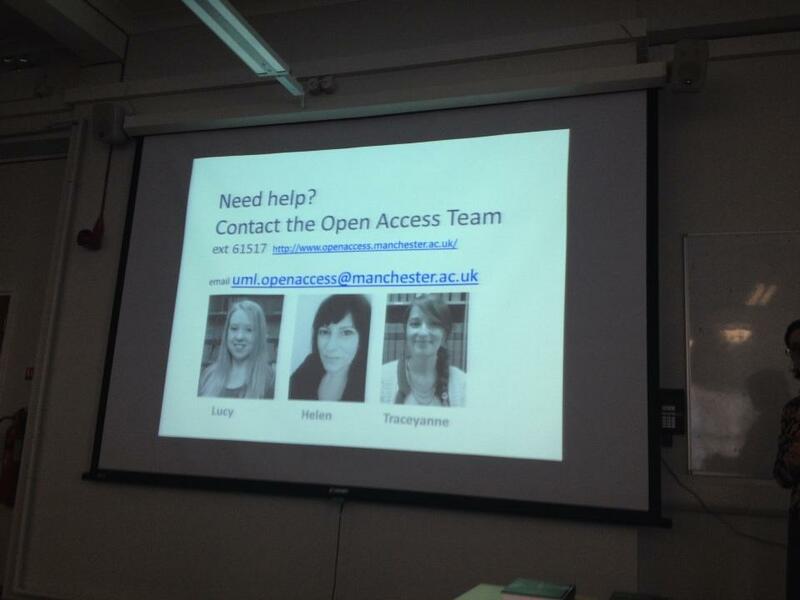 We’ve taken the recommendation of the Finch Group to heart and have shared the costs of publishing with University of Manchester authors as a first attempt to remedying this problem, telling them that the University spent a total of ~£5million on journal subscriptions in 2013-14 and informing individual authors of the cost of article processing charges (APCs) – added to which there may also be page, colour or submission charges, let’s not forget – paid on their behalf. Most of the charges we’ve paid have been to publishers of subscription journals offering a hybrid gold option, along with most of the UK universities in receipt of OA grants from RCUK and COAF. With even more money flowing from university libraries to large commercial publishers there’s a new chapter in the Serials Crisis – an urgent need for offsetting schemes to address the issue of double-dipping. This work has already begun and we’re feeding into these discussions. However, the models we’ve seen so far are early experiments that need further refinement to be truly ethical. OA advocacy is at the heart of our interactions with researchers and we tailor our message to audiences at a disciplinary level and to individual authors as required. This is necessary to win the hearts and minds of researchers for whom subscription publishing is the cultural norm, or to encourage a new generation of researchers to confidently challenge the advice of their senior colleagues, who frequently fall into that first category. And while we might repeat core messages, the effectiveness of our advocacy depends on the nuance, which requires the thinking that Beall sees as unnecessary. We tell researchers about the OA publishing model, explain why they need to know (and as funded researchers and/or employees of a UK HEI they do need to know) and why they should care. The most effective message to some authors might be pragmatic (“you might jeopardise your chances of securing funding with a particular funding body if you don’t publish OA”) but we always include positive messages about extending readership and the public good. I often relate the experience of researchers in other parts of the world with severely limited access to academic journals, based on the inspiring presentation I heard Erin McKiernan deliver at the 2014 SPARC OA meeting. 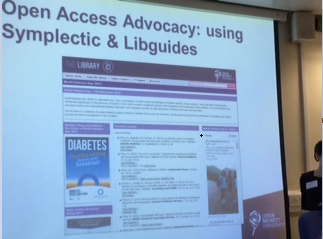 We find our advocacy activities most successful when we engage researchers in discussion based on our experiences of providing OA support, and this is as important for us as it is for the researchers because it allows us to understand the barriers to OA. Mostly this is down to complexity of publisher workflows – traditional publishers that is – and remembering to choose an OA option. We hear these concerns often, much more so than the questionable publishers Beall focuses on, and we respond to these concerns by participating in RLUK-led initiatives to engage publishers in discussions on the simplification of OA procedures or, at a local level, by reminding authors to make new papers OA, and we know that traditional publishers are also helping with this culture change. This doesn’t mean that we are enemies of traditional publishers, as Beall might suggest, rather that their systems and workflows aren’t as intuitive for authors as they might believe, and the scale of support we provide to authors addressing problems relating to these publishers makes this a priority for us. But that’s not to say that we are simply reactionary in our approach to OA. We do react, of course, to new funder policies, new publisher workflows, but we are also hugely supportive of new developments in scholarly communications, eg, JiscMonitor, ORCID, Altmetrics, and we are always interested in the emergence of new publishing models. We have responded to requests from Manchester researchers who wish to publish RCUK-funded papers with PeerJ by setting up an institutional membership plan. We are working in partnership with our colleagues at Manchester University Press, developing the Manchester Open Library imprint. The latest journal in development is student-led and will operate a form of peer-review that MUP CEO, Frances Pinter, considers worthy of patenting. We are also supporters of Knowledge Unlatched and the Open Library of Humanities, and are encouraged to see traditional publishers experimenting with OA monographs as the sector seeks a sustainable business model. OA has created opportunities for experimentation and innovation in publishing, driven by energetic and passionate individuals. There are too many to name but Martin Eve certainly deserves a mention after bizarrely being charged with hypocrisy in Beall’s STM presentation last week. We don’t disagree with Beall on everything, eg, we don’t dispute the existence of questionable OA journals and publishers. As fund managers for the University’s OA grants from RCUK and COAF we take our duty of care to authors and funders seriously. Requests for APC payments prompt an extra Quality Assurance check in the publication process at Manchester which allows us to alert School Research Directors of submissions to journals of questionable reputation. Our website advice also provides a checklist for authors to consider as part of their publication strategy and we’ll now focus on this type of guidance until a community-driven alternative to Beall’s list emerges. Off we go, Lucy and I, out into the Yorkshire cold to attend an Open Access (OA) advocacy event held at The University of Bradford. We are warmly welcomed to a great afternoon with engaging speakers, and a fun exercise from the man behind the OA innovations at the University of Huddersfield, Graham Stone. 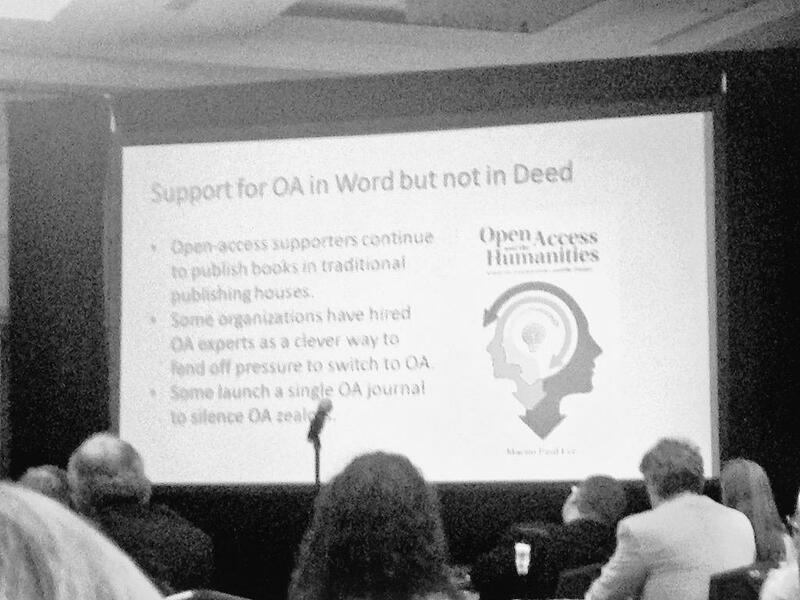 Our first speaker was Professor Charles Oppenheim who shared an overview of OA and its importance for academic libraries. He opened with some punchy headlines (which had all the delegates mumbling in their seats) about the monopoly of publishers and their reluctance to share scholarly work for free – using the Ebola crisis as an example. Some publishers have been withholding integral research on the subject unless subscriptions and fees are paid; stating even with a terrible crisis developing there was still the need for a ‘healthy’ profit margin. This led very nicely to his second headline that Elsevier had made a bigger profit in the past 12 months than Google! Despite these alarming headlines, he did emphasise that he was not anti-publisher but there are still some important guidelines that needed to be solidified, using the help of government mandates and institutional gumption! Nick Sheppard and Jennie Wilson from Leeds Beckett summarised their technical challenges and new workflows. 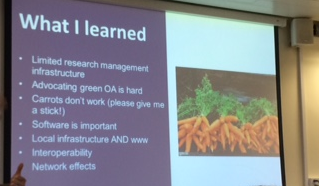 Nick took us through the difficulties of advocating green OA in response to the HEFCE announcement and the jump for institutions to embrace new software and repository infrastructure. 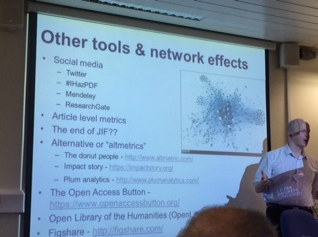 Nick went on to highlight the importance of social media and altmetrics in drawing attention to the importance of OA and the academic world, and the impact on citations. Jennie gave the audience a glimpse into the new pressures she has dealt with. 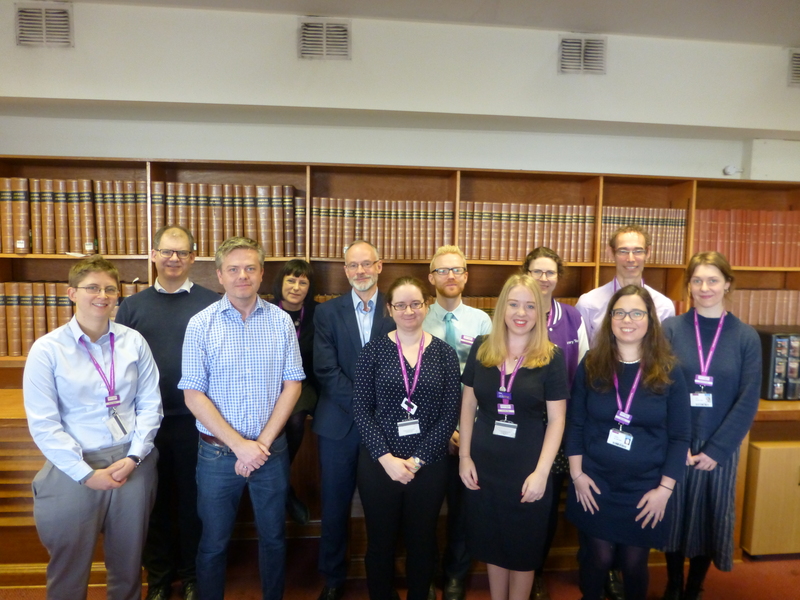 Leeds Beckett didn’t receive any RCUK funding so her team had to come up with innovative strategies to encourage authors to engage with OA and explained their use of social media to promote services and encourage authors to deposit in their repository. Their use of LibGuides really had the room buzzing. Jennie explained how they used Twitter feeds about hot topics, such as World Diabetes Day, to capture articles relevant to the discussions. and had a rolling feed on their LibGuide website. This turned out to be an effective incentive for authors to deposit their papers, as well as a way to showcase research taking place at their institute, a ‘win-win’ all round! Our final speaker was the enthusiastic Graham Stone. 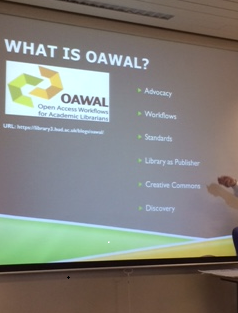 We were introduced to the OAWAL project (pronounced like the bird! ), a new initiative sourcing workflows and best practices for the OA community which aspires to develop into the ‘go to’ place for management of OA in institutions. 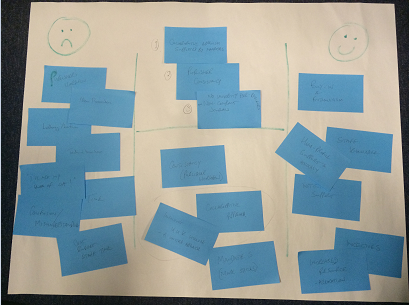 Graham then led an exercise to highlight the negatives and positives we face in the OA world. In groups we figured out ways of resolving the issues, highlighting the top 3 priorities. In our group the negatives were things like lack of consistency among publishers, staffing and money. We did find some good positives such as strong mandates and buy in and enthusiasm, and high profile support and advocacy. We came up with a few solutions such as having a more collaborative approach, more mandates and the use of ‘sticks’. Our top 3 priorities were 1) a more collaborative approach supported by mandates, 2) publisher consistency and 3) encouraging academics to refuse to carry out peer-review for publishers that don’t allow authors to comply with funder policies. This exercise was useful as it highlighted that everyone seems to be dealing with the same issues and having the same pain points, and that there is a community out there who can provide advice, personal experience and hopefully a network on best practice and standards. 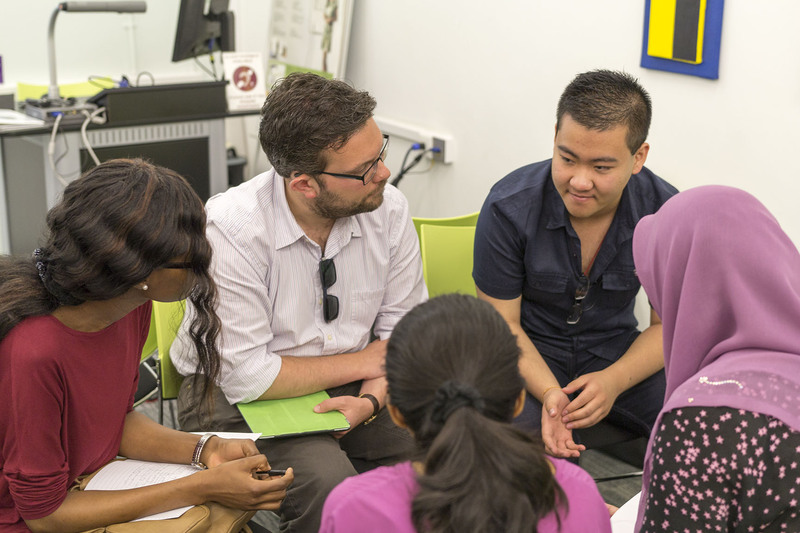 Developing communities and sharing experience is also a focus for Manchester as the lead institution on the opeNWorks JISC pathfinder project. Lucy and I really enjoyed the session and thought the choices of speakers were well thought out and varied. There were a few questions and answers and an opportunity to network with colleagues in similar roles, so all in all a useful session.